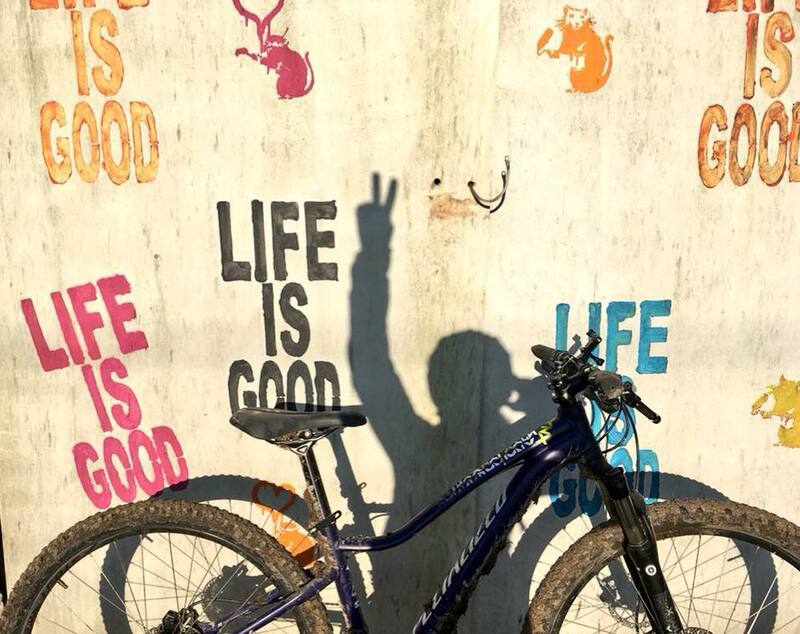 Two wheels, rolling countryside, freezing cold blue skies and uninterrupted sunshine. Is there a better way to spend a weekend? Maybe, if it was a teeny bit warmer, so you don’t end up looking like Rudolph from the wind chill, but apart from that, I don’t think so. 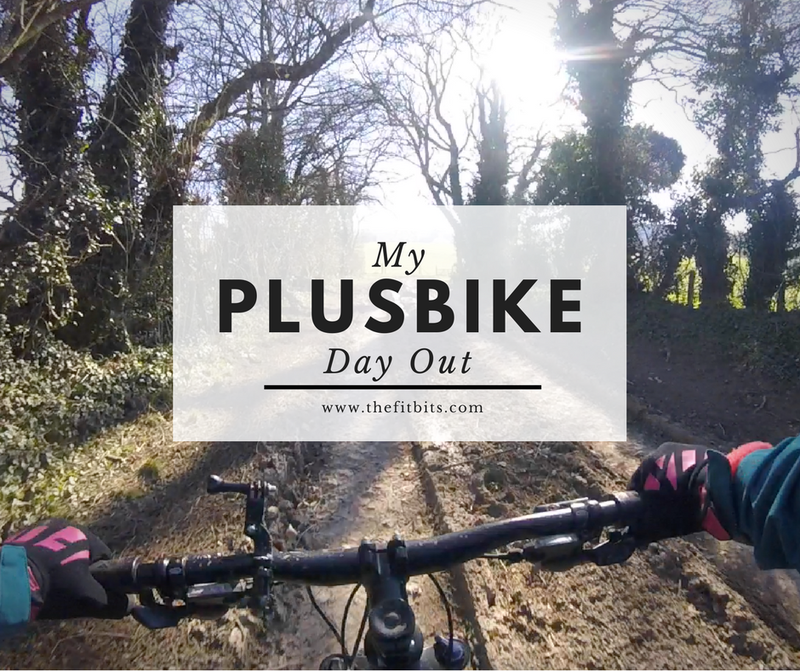 I’ve been wanting to share my PlusBike Day Out with you for a while and it’s finally time. 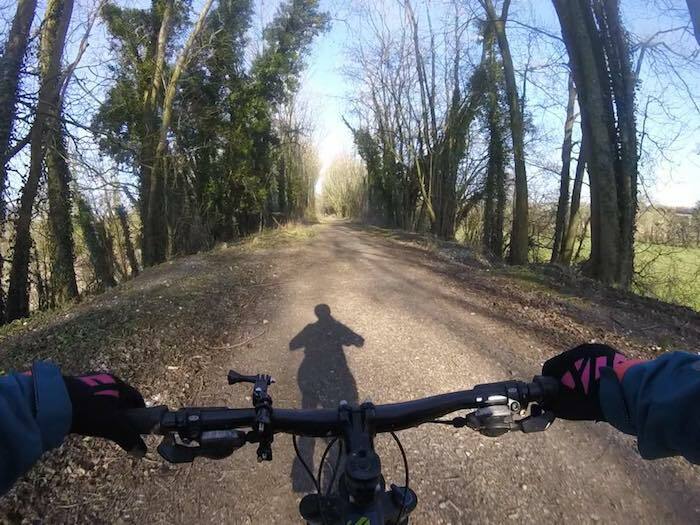 If you follow me on Twitter or Instagram, you may have seen my mini solo mountain bike adventure last month when I took my trusty steed on the train to Winchester to ride the part of the South Downs Way I’ve never done before. It was an adventure thanks to the National Rail Enquiries’ PlusBike tool, and I’ve teamed up with them to show you how nice and easy it is to jump on a train with your bike – or hire one at the other end – and enjoy a lovely cycle ride in a new place. The PlusBike tool is available within the National Rail Enquiries mobile app and online, giving info such as bike restrictions or reservations on trains (important for London at peak times), secure bike-parking facilities at stations, and also local bike hire where provided. As I had my own bike I didn’t need to hire one but this I thought was pretty cool as it opens up more places to explore on two wheels. The more we can make cycling accessible the better, right? Which means I’m responsible for my own planning, navigation, timekeeping and feeding. Those who know me will know that apart from feeding, these things are definitely not my strong points, but in the spirit of being This Girl Can Ambassador, I can, and I did. What if I get lost? What if I can’t find the South Downs Way? What if I go off course and end up down a rabbit hole? Spoiler – I did go off course early on, but only slightly, and found my way back with the help of the OS mobile app – God only knows what I’d do if the internet ever ceased to exist. Lolz… went off course in the first 30mins – thank God for the OS maps app! Usually I ride in a group or with Chris, and I’m embarrassed to say that for someone who truly LOVES cycling and has done since day dot, my bike maintenance knowledge and skillset is pretty minimal. I’ve been on a basic course but it kinda went in one ear and out the other, (I need to do things to learn, not just be shown them), so this was unknown territory for me. At the start of this year I made a resolution that 2018 would be the year I learn to look after my own bikes. This is partly a money saving exercise – far too much of mine is going into the pockets of the very helpful staff at the bike shop down the road – but also part of my 2018 This Girl Can / JFDI manifesto. ⤖ Tess can change her own brake pads (with only a slight paddy in the hallway when she tries for too long to undo the wrong bolt). 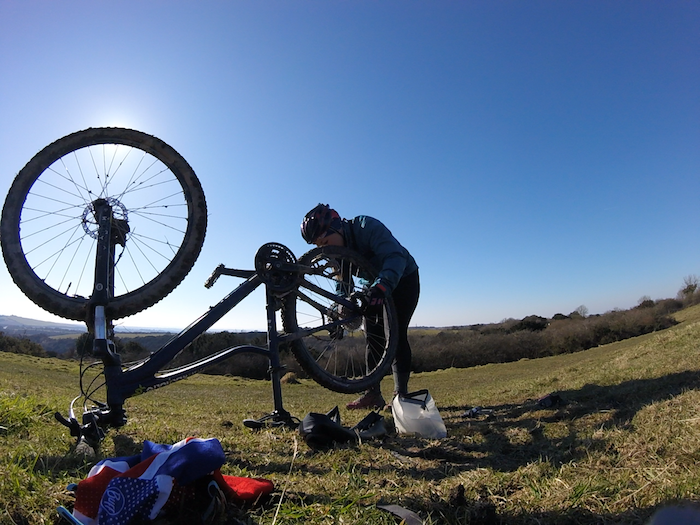 ⤖ Tess can change a puncture in the middle of the Downs (after half an hour of faffing about using the pump wrong before realising). I woke up for the 6:30am train and promptly missed it so was a bit delayed in getting to Winchester. No worries though – the sun was shining ALL day and I was in no rush. It was also FREEZING cold, and I was layered to the eyeballs. I had two buffs on under my helmet, one on my neck, two pairs of gloves, a base layer, my Liv thermal jersey (absolute BFF this winter, love this top so much). For once my feet were OK which made a change, but my poor reynauds-ridden hands were absolutely not. Ohhhh the cold. 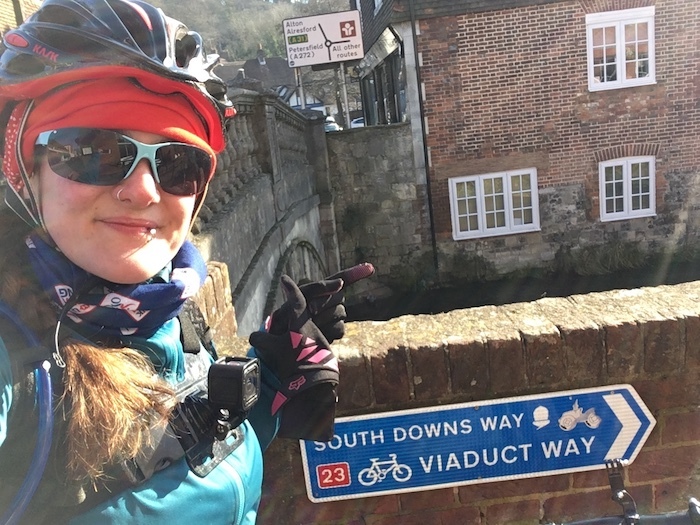 After a fair amount of faffing I rode from Winchester station to find the SDW via a lovely canalside National Cycle Route and began the first big climb. We’ve had such a wet winter I was worried about the mud and whether the Downs would be rideable but to my relief it was so cold all the mud had frozen solid so was actually a dream to ride. The route was a mix of fields, tracks and tiny country roads connecting cute little villages, with surprisingly not too many hills. I reckon this part of the SDW is actually the easiest in terms of elevation. The Eastbourne to Brighton leg is the worst, with the Seven Sisters, and Petersfield to Amberley the prettiest I’d say, with its gravel tracks and woodland paths. Because it was so cold there was hardly anyone out there, bar a few walkers and three friendly blokes on fat bikes, one of whom kept falling off his just in front of me, helpfully showing me the line not to take through the icy mud ruts. After a brilliant day’s riding, I was surprised at my ability to successfully adult enough to get to my B&B in East Meon, which was LOVELY btw. If you’re ever walking or cycling the South Downs Way between Winchester and Petersfield, you absolutely must stay at The Longhouse. The owner Marjorie was so lovely and accommodating, drying my paper on the aga when I soaked it washing my bike, putting the heating on for me EVERYWHERE so it was nice and warm after my amazing hot shower, and even driving me to the pub and picking me up again for a much needed refuel dinner (and a massive glass of red). My own pack of biscuits in the room and made it back for the rugby 🙂 WINNING. The whole back wing of the house was the B&B with its own kitchen diner and I had it all to myself because no other nutters were out on the hills in that cold. In the morning – which happened to be Marjorie’s birthday! – I sat at her kitchen table and enjoyed a breakfast of homemade sourdough and jam, with eggs, bacon and mushrooms. When planning my trip I made a point of trying to find a nice little B&B instead of a soulless hotel. The South Downs Way snakes in and out of so many lovely little villages that it’s almost rude not to stop by for a taste of village life. At only £55 per night, I wasn’t disappointed, and you won’t be too – check out her website here. Ha what a massive faff Sunday was. A stark contrast to the trouble-free riding I had the day before. I woke up to a hearty breakfast at Marjorie’s table and headed out to complete the final few miles to Petersfield. I had a choice – about seven or so on the road, or get back up on the SDW to ride four or five more miles and drop down into Petersfield. You’d think it was simple, but alas, no. 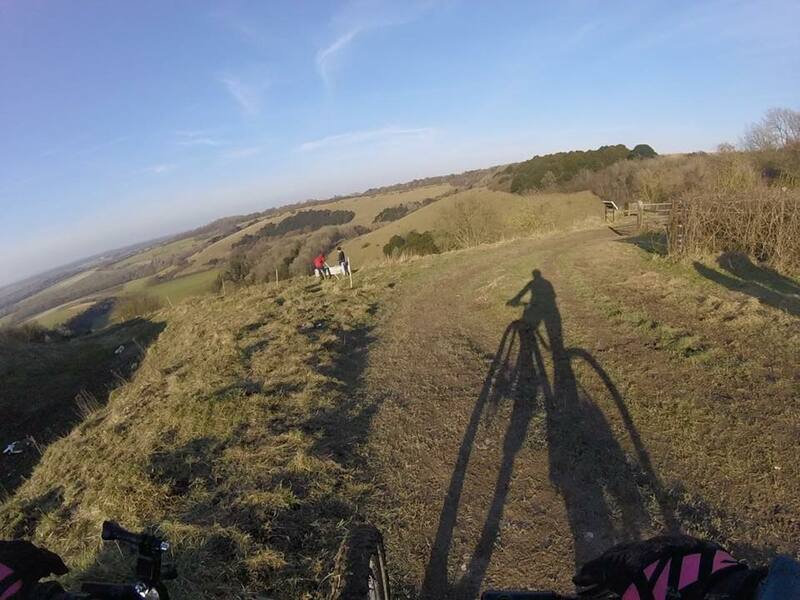 The route was simple enough – ride out of East Meon up a farm track, big hill, then along the SDW and down to Queen Elizabeth Country Park onto Petersfield. But the very first track wasn’t that rideable, nor was the massive hill, due to huge ruts in the ground from motorbikes and farm vehicles, and by the time it was rideable it was so steep I couldn’t get going so I had to just lug my bike to the top. Add to that the icy mud had started to melt and was now really sticky and clogging up my wheels, chain and bike. Sunday faff no. 1. Finally get to the top, ride a bit and think yeah, this is it, then – get a bloody puncture. And that was Sunday faff no.2. I fixed it, eventually, after half hour of getting angry with my tiny little pump not working properly. The prospect of a 90minute walk to Petersfield wasn’t that appetising so I was glad to finally get back on the bike and drop down the hill into Queen Elizabeth Country Park. Which, is GORGEOUS by the way, have you been? When I realised my handy work had not been so handy and the tyre was flat once again I stopped at the café for a sympathy cream tea, changed the tube and used their track pump to do a better job than my little one had just done. By the café there’s a host of bike and walking trails – including a couple of blue and red graded mountain bike trails which I didn’t realise until just now! There’s also an assault course, play area, and even a dog activity course. I’m definitely gonna go back there with Chris and test out their mtb trails, but for this trip I had to get back so took the National Cycle Route from the park to Petersfield and jumped on a train home. Getting the train makes it an end-to-end journey and a bit more of an adventure than a loop ride. You have to get somewhere on your own steam. And, using the PlusBike tool opens up a new world of places to ride a bike, whether you take your own or hire one at the other end. Find out more info about National Rail PlusBike and plan your own day out at www.nationalrail.co.uk/plusbike. If you like this video pls subscribe to my YouTube channel as I’ll be making a lot more over the next year!